New York in December. There’s really no place like it. 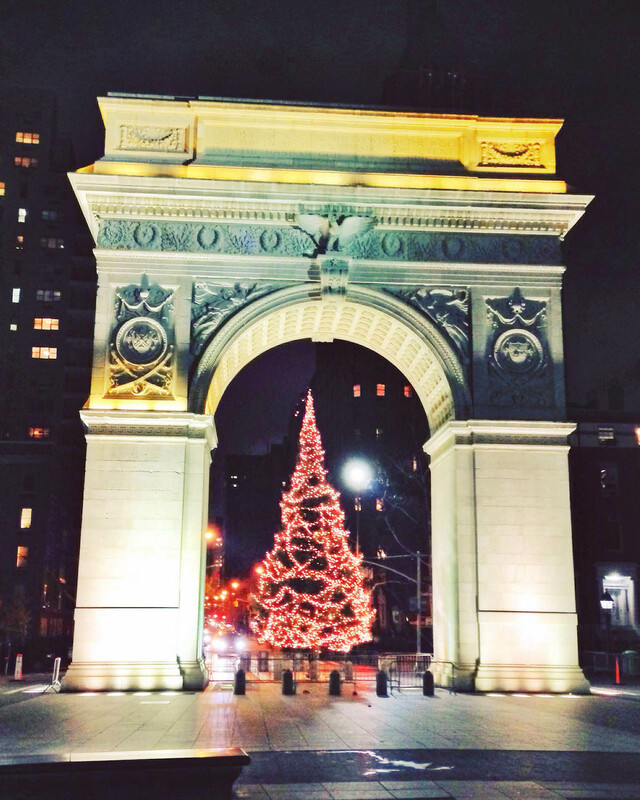 This will be my fifth holiday season in New York and every year I fall more and more in love with the city in all its festive glory. 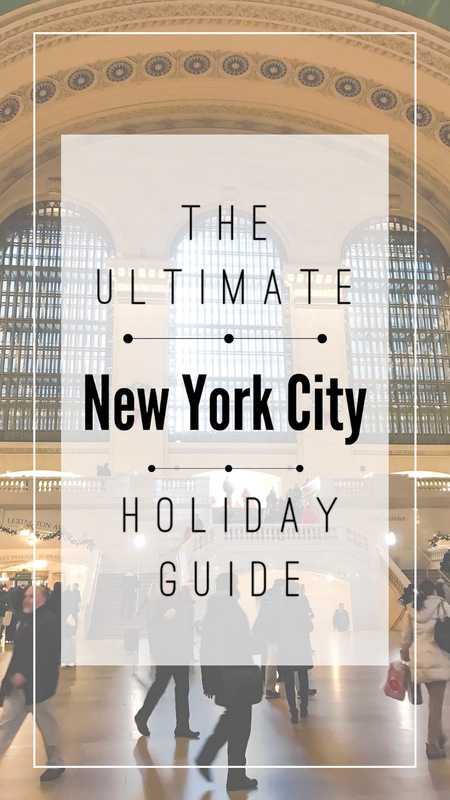 I’ve been getting so many messages and requests asking for recommendations and tips for what to wear when visiting in December so here you have it: The Ultimate New York City Holiday Guide. I tried to make this as comprehensive as possible including the quintessential tourist attractions (I honestly have nothing against these and shamelessly have indulged in them myself) along with the places and restaurants locals will frequent for their fill of Christmas cheer. Enjoy! PS if you’re interested in seeing my general New York recommendations make sure you peek at my NYC Guide, which can be found here. I’ve seen both and can guarantee you’ll leave each performance feeling all the holiday vibes. I personally prefer The Nutcracker– I grew up taking dance classes and the New York City Ballet is one of the best companies in the world. The Radio City Christmas Spectacular is definitely something you should see at least once, but it’s 100% catered to tourists. Radio City Music Hall is huge (bring your glasses if you wear them) and they allow guests to take photos during the show. This is a pro and con because yes, you can take pictures for the memories, but it’s really annoying when you have someone in front with their phone or camera out. If you have kids, definitely opt for the Christmas Spectacular over The Nutcracker. I have no shame when it comes to indulging in cheesy photo opps and over the years have gathered lots of festive snaps at various decorated spots in the city. It’s convenient that most of these photos opps are located all within walking distance in Midtown. If you’re looking for the perfect shot, my best advice is to always start your day early in the morning before crowds arrive. 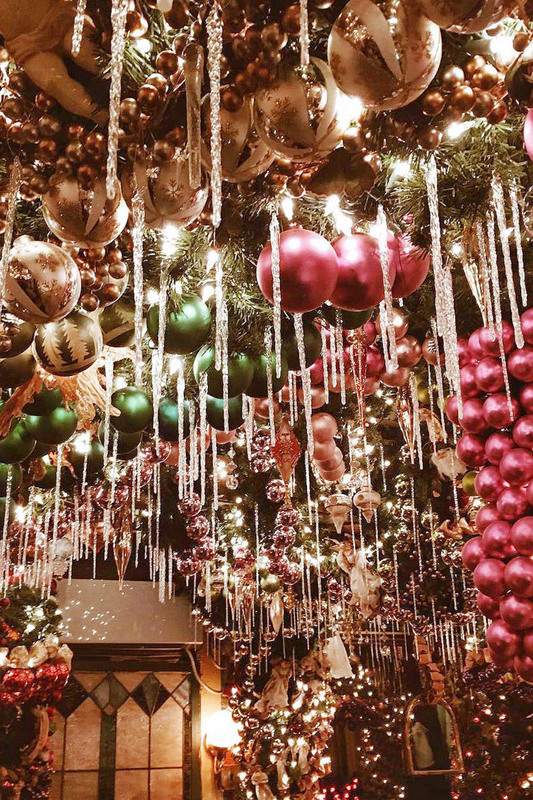 New York hotels love to go all out with incredible decorations at the holidays. 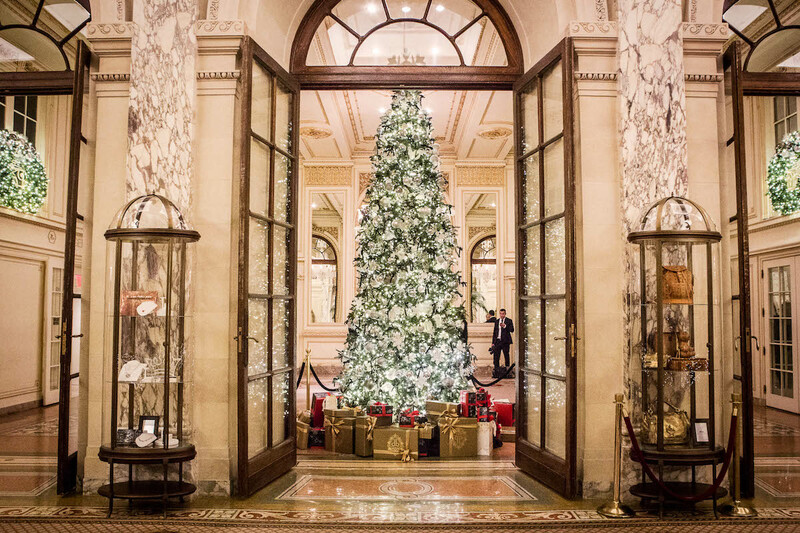 If you’re looking to kill some time without spending money, it’s a lot of fun just walking around exploring hotel lobbies in their festive splendor. 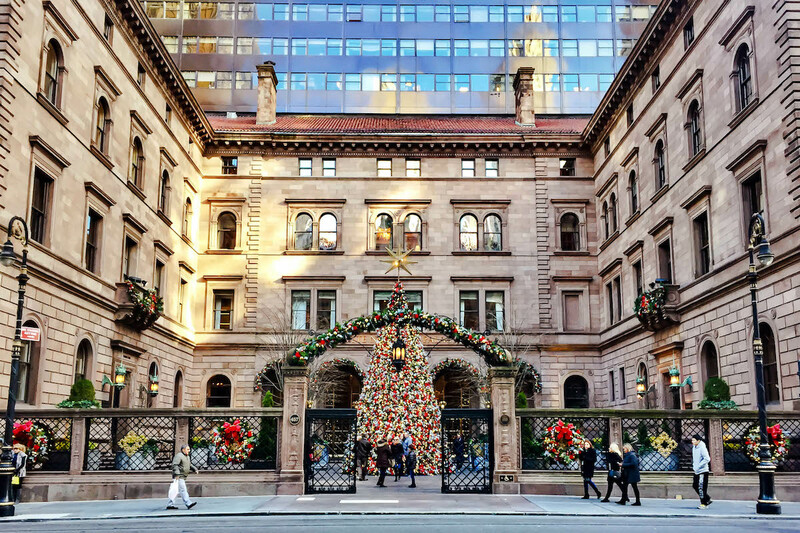 The famed Christmas tree in the courtyard that everyone Instagrams can be found at the Lotte New York Palace. 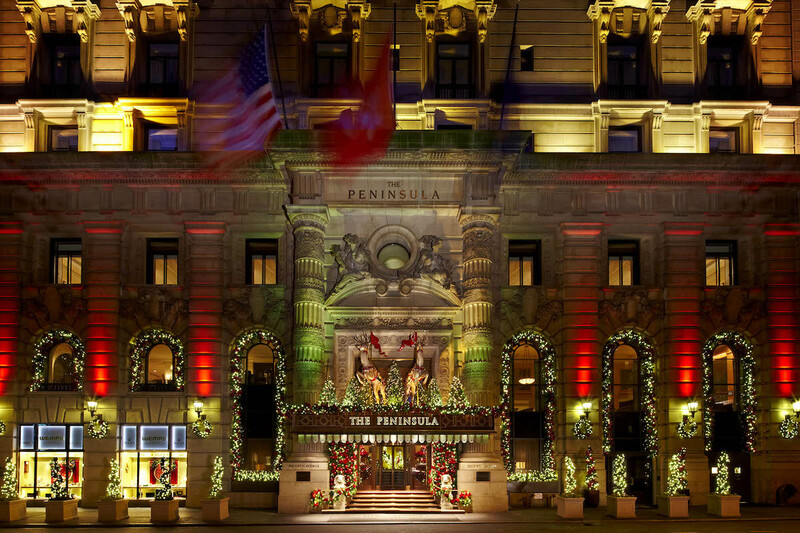 The Peninsula also always has amazing decorations adorning the exterior of the hotel which makes for a great shot. 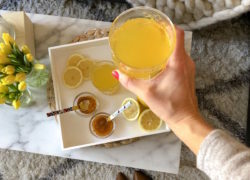 Hotels are always great pitstops for bathroom breaks or grabbing a cocktail or coffee too. It’s a shameless tourist spot, but it’s worth going once for a drink and to get a photo of the ornament-adorned ceiling. I’d try to make a reservation if you can (I attempted to last year but no one ever picked up the phone.) If you don’t have a reservation, I’d recommend going on a weekday or as early as possible. Last year Nick and I went at 11AM on a Sunday and had to wait in line for over 30 minutes. Apparently this is where the bloody mary was invented! It’s fancy and pricey, but the holiday decor is always on point and any meal will become a special memory. 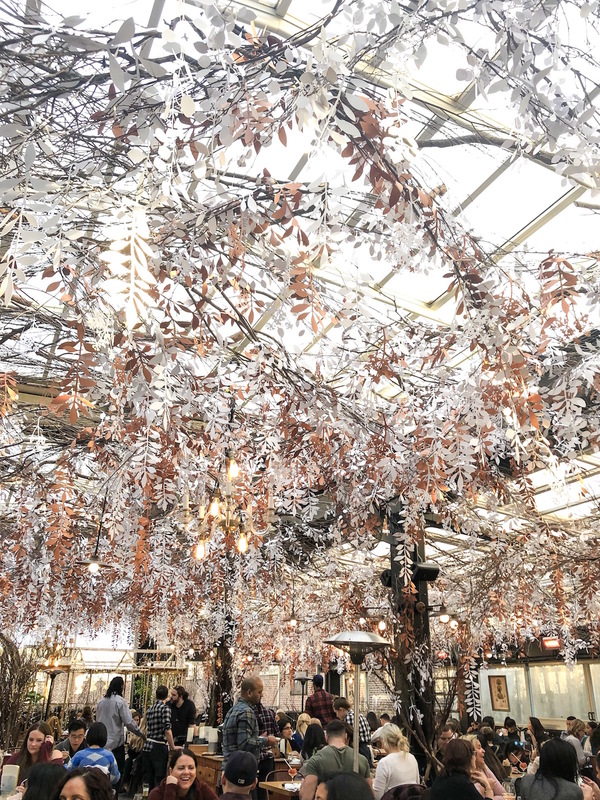 Every winter Eataly transforms their rooftop into an alpine ski lodge with sheepskin rugs & throws, Christmas trees and festive decor. The vibe is really fun and upbeat so it’s a great place for groups or to grab a drink with your boo. I’d HIGHLY recommend only going for drinks at the bar and to take a photo of the decorations. The food is incredibly subpar and not worth the money especially when there are so many other great options nearby! This is hands down my favorite upscale bar in the city year-round. Nick and I go all the time and have never been disappointed. The drinks are expensive ($20 a cocktail) but in our opinion completely worth it, especially if you can grab a spot next to the cozy fireplace. The bartenders (who all wear suspenders & bowties) are extremely knowledgable and every drink is meticulously crafted. It’s definitely a place to go if you want to be impressed and feel super chic in a Great Gatsby-esque cocktail estabishment. There’s a small food menu for bar patrons, but if you really want to go all out dine in the hotel restaurant. We celebrated Nick’s birthday there two years in a row and had some of the best food we’ve ever eaten in New York. The Rose Bar is another one of my go-to fancy cocktail spots. The hotel itself is beautiful and has a roaring fireplace in the lobby perfect for warming up on a cold night. It is a bit of a celebrity/fashion crowd hotspot so there is a a door policy on busy nights and weekends. To avoid any snootiness or having to wait in line, I’d recommend going on a weeknight or in the evening before 10PM. I just discovered this speakeasy-type bar in Gramercy (right down the street from The Rose Bar) and I’m obsessed. It’s tiny and a bit secretive, so you need to make a reservation in advance. The cocktails are amazing and the vibe is so cool– you literally will feel like you’ve stepped back in time! To order drinks you have to press a brass button on the wall next to your table to call a waitress. When I went we ordered a few small bites, which were also very yummy. You have to stop in Tiny’s if you’re downtown in Tribeca. Located in a cute historic pink townhouse, Tiny’s has two different bar areas so you can go and post up for a drink or sit down for a meal (they serve brunch too!) The menu and decor is very rustic and all-American. It works as a date spot or a great place to go with your girlfriends! While it may be known for it’s delicious dining and romantic ambiance, One If By Land, Two If By Sea has an equally impressive bar and drink menu. When we went for Nick’s birthday a few weeks ago, I had an incredible mezcal, pear and egg white cocktail that I’m still thinking about. There’s also a live classical pianist playing by the bar, so even if you aren’t going to eat it’s worth stopping in for a drink. If you’re looking for somewhere with an old school, Irish pub vibe then come here. 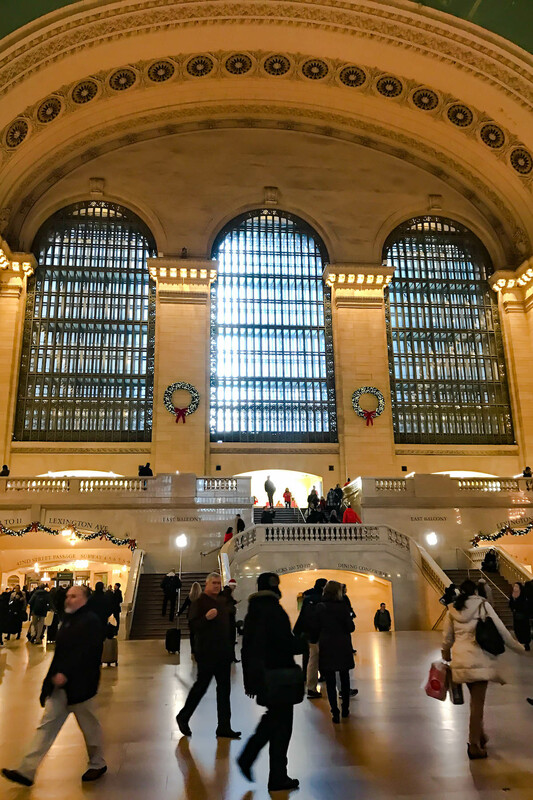 It’s way downtown in the Financial District but within short walking distance of all major subway lines and the South street Seaport (an up-and-coming neighborhood with great food and shopping.) Apparently Dead Rabbit has the largest whiskey collection in America and Forbes even named it the “World’s Best Bar” in 2016. 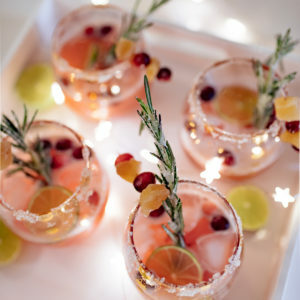 So so cute during the holidays! Just envision dangling Christmas lights and garland from the ceiling. This is a place to come if you’re looking to cozy up over multiple plates of yummy Italian comfort food. This is always one of my no-fail last minute spots for brunch, lunch or dinner. The food and service is always great and it’s pretty easy to get a reservation since the restaurants are so large. I love how they add seasonal specials to the menu every few months– there’s always something new to try along with the classic faves like the chicken pot pie and lobster roll. There are multiple locations throughout the city too. One of my favorite brunch spots in the city year-round. They don’t take reservations so try and arrive early or expect to wait for up to an hour. It’s totally worth it though! Another romantic and magically rustic Italian spot in the West Village. 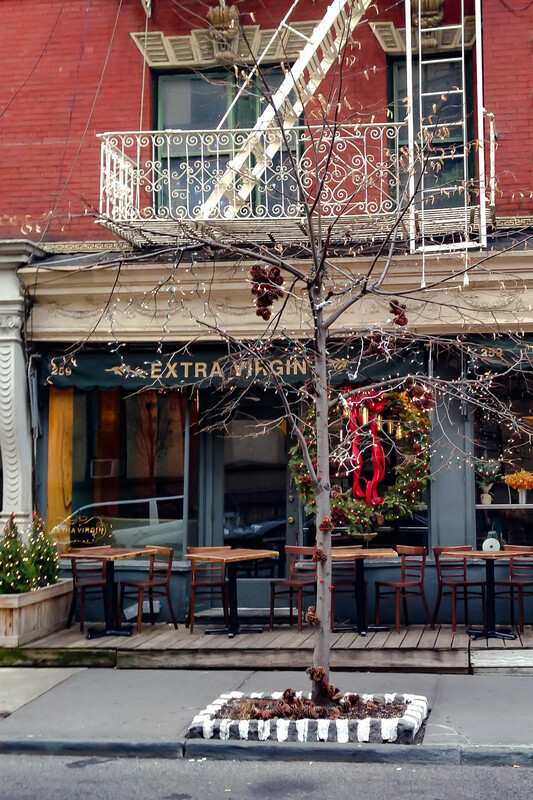 Quintessential West Village restaurant on a tree-lined street with stunning townhomes. It’s more of a special occasion place, so I’d only recommend eating there if you’re willing to spend, but trust me you won’t be disappointed! One of my favorite seafood restaurants! There are a few locations so take your pick. Definitely try and go during happy hour when there are $1 oysters and discounted drinks. Omg the burger and shoestring fries… SO GOOD. Casual laid-back pub with amazing drinks! One of the best Italian and pizza restaurants in the city. Super casual and great for groups! Rustic hearty american fare with a colonial tavern feel. By far one of the coziest restaurants in the city! It’s a bit hidden away in a small alley so many sure you Google map it. 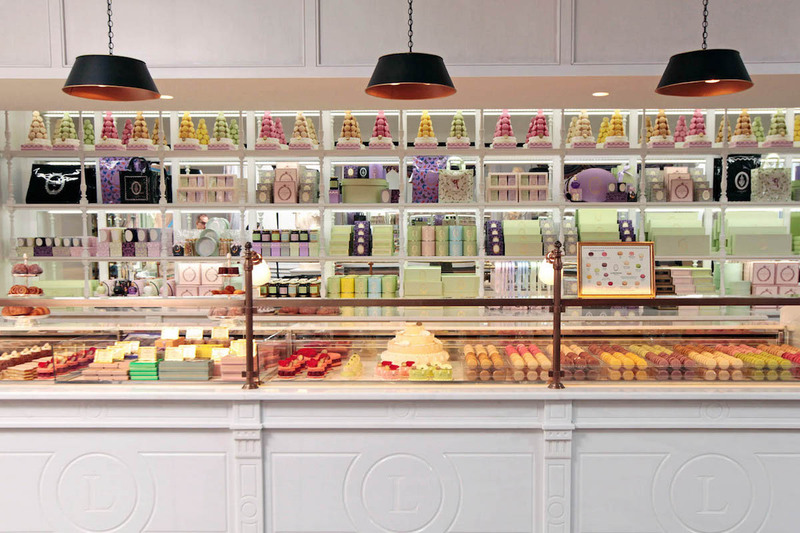 At Claudette you’ll feel like you’re dining in a French country cottage. 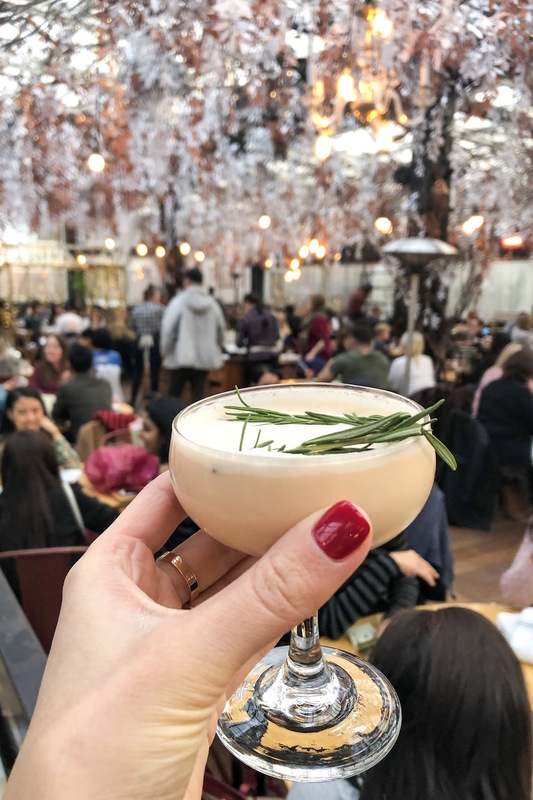 This is a great spot for brunch or dinner with the girls, just steps away from Washington Square Park and all the best spots in Greenwich Village. Super chic Bobby Flay Mediterranean-style restaurant and my favorite spot for tapas. It’s a bit tough to get reservations if you don’t make them far in advance, but if you go early enough there’s a good chance you can get seating in the bar and lounge area where they also serve the full menu. Really popular (and yummy!) casual spot for Spanish tapas and sangria. There are three locations in Soho, Flatiron and the Upper East Side. The interior is super cozy– just remember to make reservations because it gets packed! Clearly I’m easily entertained because just walking around the Upper East Side and looking at townhouses is an adventure for me. 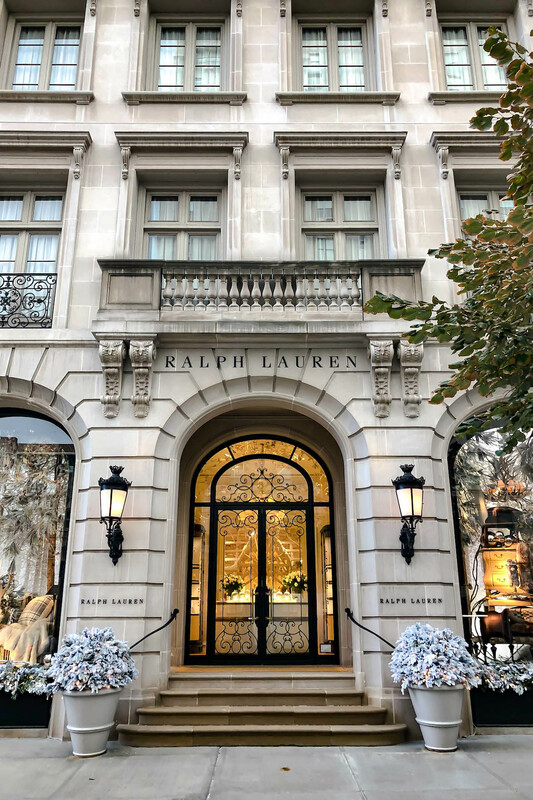 There’s no neighborhood in New York quite like the Upper East Side and it’s one of my favorite places to frequent no matter the season. 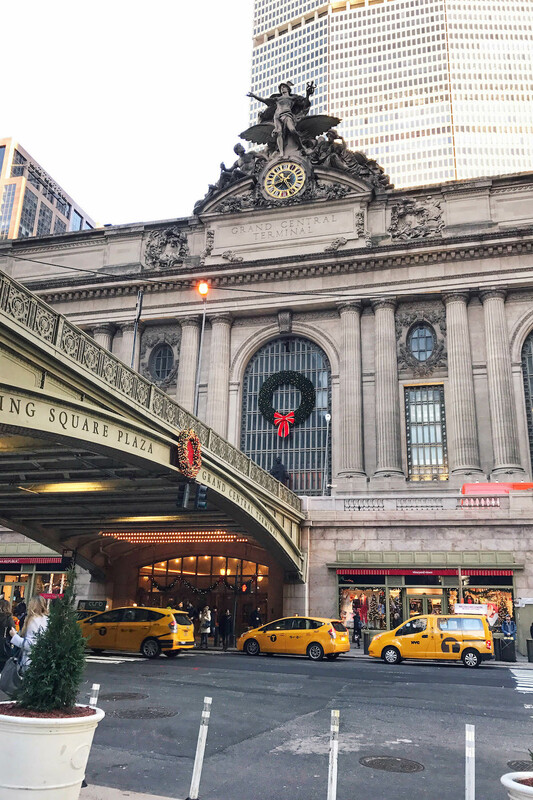 During the holidays everyone decorates their homes, the stores along Madison Avenue get festive and the trees of Park Avenue are adorned in lights– it’s really something to see. If you’re looking for a downtown neighborhood to explore the West Village is super cute, but I find it to be much busier and the streets aren’t always the cleanest. I’m personally not big on ice skating (bad balance) but it’s one of those quintessential New York winter activities. There are a few different rinks in the city. 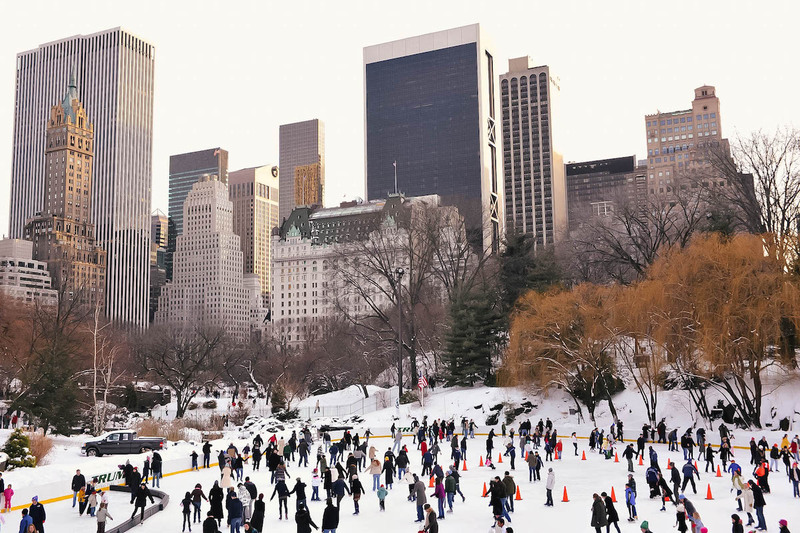 The largest ones are located in Rockefeller Center and Central Park, but The Standard Hotel has a tiny one that they open as pop up during the colder months. I’ll be honest: I’ve never actually “shopped” at a Christmas market. The appeal for me is the different food stalls and all-around holiday vibes you get from exploring. 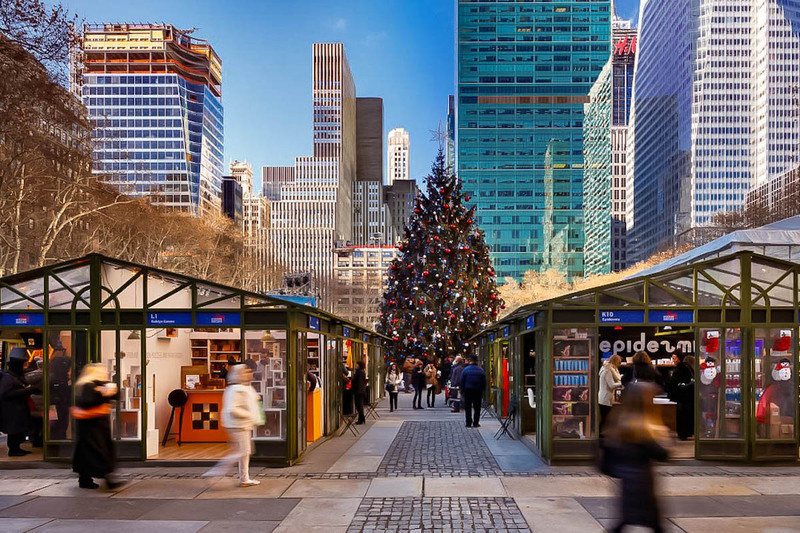 New York has three markets I know of: one in Columbus Circle on the Upper West Side, the Bryant Park Winter Village in Midtown and another downtown in Union Square at 14th Street. 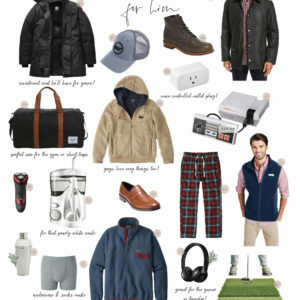 So you’ve figured out what you want to do in New York… Now what to wear? It normally doesn’t snow in December (I can only remember once in the last five years) but it is cold. The temperature can range anywhere from the 30’s to the 50’s but if there’s wind it can feel colder. If you aren’t used to the climate, I’d make sure you bring a reliable and warm winter coat (like a down or puffer) and a hat, gloves, and scarf. Also comfortable shoes for walking is key. In the winter I live in short booties like these (on casual days) and then over the knee boots for when I’m trying to dress up. I’m heading to NYC in two weeks and I can’t wait! I’ve always wanted to go to Rolf’s- looks amazing! 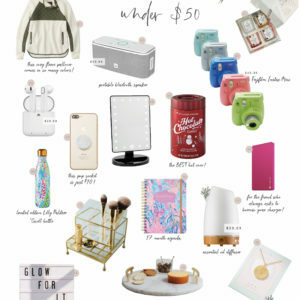 Great roundup, Katie! 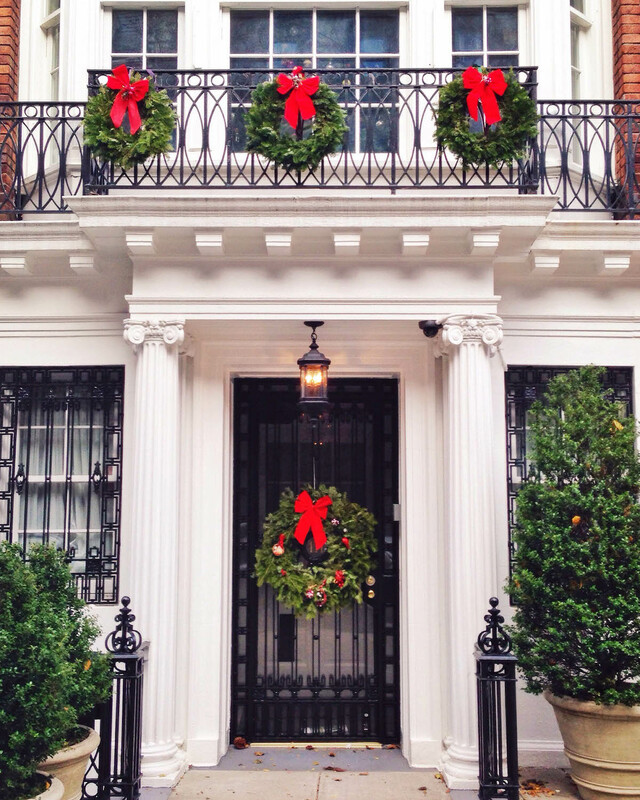 New York is one of my dream places to visit during the holidays! I hope to make it in the next couple of years. 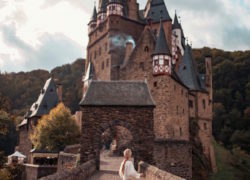 Your trip looks totally amazing so thank you for the inspiration! WOW Katie! Love all the beautiful, festive and peaceful photos! A big break from the materialistic drama of the holidays. 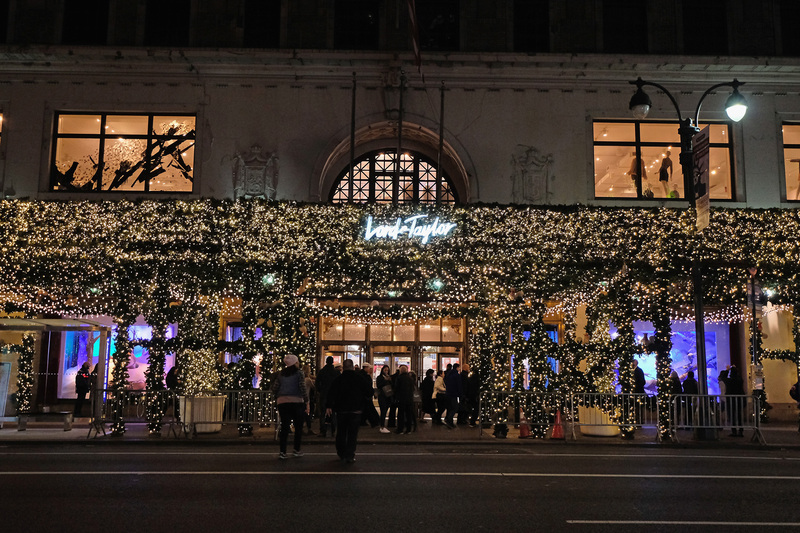 Katie, just read your blog on New York City at Christmas. Very thorough. Well done ! Hey Katie! I’ll be there Friday and I can’t wait. Although I feel like most of the Christmas decor won’t be up yet. Can you recommend places that will be up earlier than most? Omg don’t worry all the store window displays and city decorations go up the week before Thanksgiving. 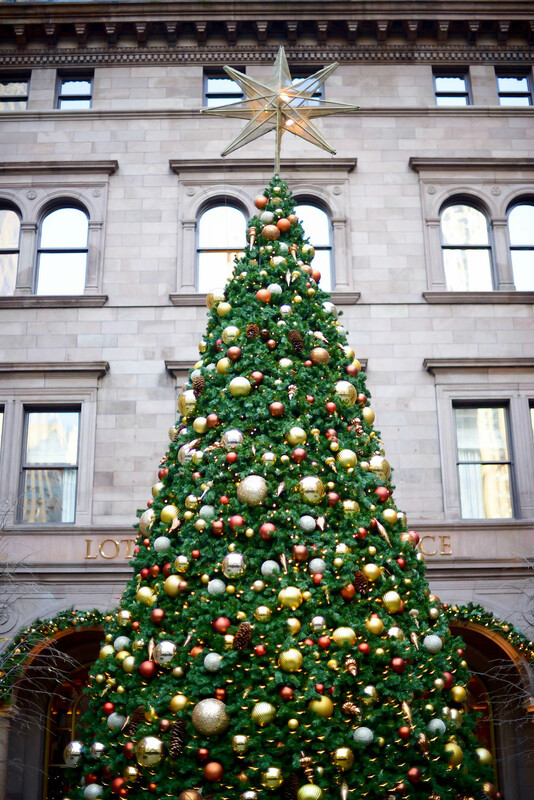 I already saw the tree at the Palace Hotel and the one at Rockefeller Center! Katie, this is a great guide! Thank you for sharing! I have been to some of the places you mentioned. I am now so curious about some other places! 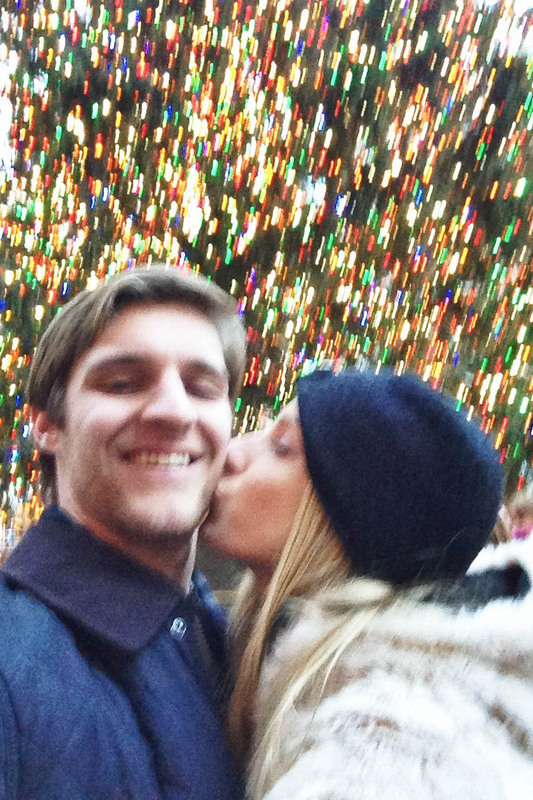 Christmas in NYC is like no other! Enjoy the holiday season! 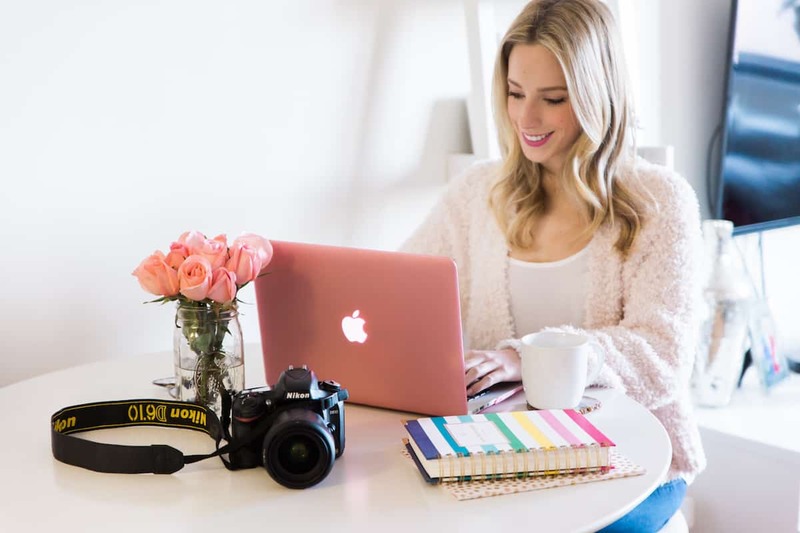 Hi Katie, great blog thanks!! I’m coming to NY on Christmas Day. Will there be any sales after Christmas? It’s my first time and really looking forward to it. I love this post!! I’ve been looking for something like this We go to NYC every year in December, but here is the catch…we only go for the day! We always try to fit in as much as we can so we don’t spend much time sitting down for a meal. Are any of the restaurants you recommended places for quick eats? Do you have a favorite deli? Thanks for sharing this! sandwiches go to num phang. Its a litte expensive ($15) and simple but i love the prime rib sandwhich at eataly. 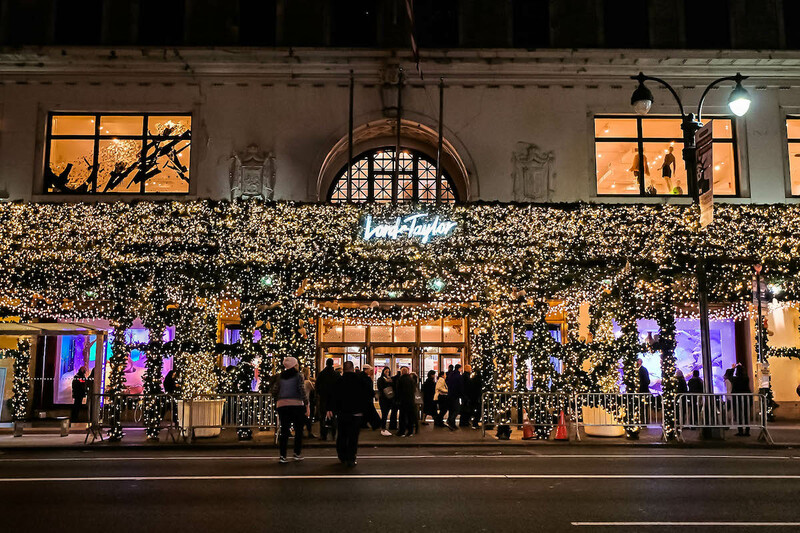 This has to be hands down the best NYC Christmas guide I have seen. I go every year and looking forward to trying some new things from your post! thanks so much! My best friend and I are coming to NYC for the weekend in two weeks to celebrate our 30th birthdays. This post is exactly what I’ve been searching for! Thank you, thank you, thank you! This is my favorite post ever! I love Christmas and I love New York! And next year I’m going to NY again, for Christmas or New Years!! I’m so excited! This is going to be such a help for me! It looks magical!